Click here to open a more extensive map in a second browser window. Anyone who knew the path running South from Melbourne would be familiar with the way it ran into a rats-nest of less attractive paths. This has now been changed with the opening of a new section of permissive path just being finished. It adds to the previous permissive path from SK388228 to SK385225 by building a short causeway in the small swampy field across the road and making a new path within the edges of Spring Wood. The new section runs from SK384225 to SK380222, where it crosses the road to join the older permissive path running to Staunton Harold Hall. The route is well marked and it has the attractive curving V-stiles used on the other Staunton Harold paths. 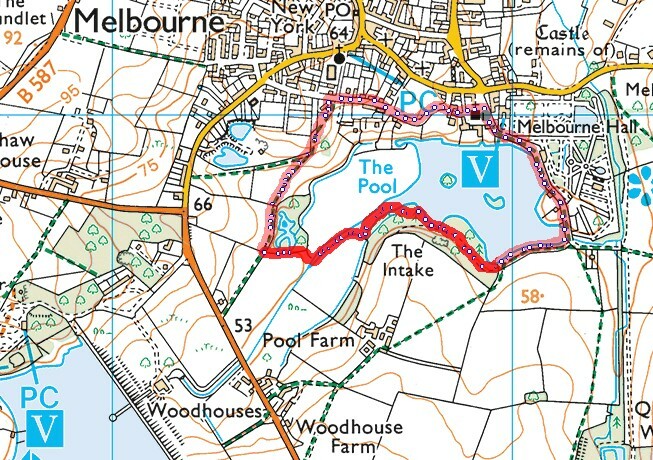 This means that one can walk from Melbourne Hall to Staunton Harold Hall and then walk down the drive to loop back through the attractive Dimminsdale Wood before retracing ones steps to Melbourne from the car park at SK378219 onwards. Total length from Melbourne Hall is just over 11km. I have always taken binoculars when walking across the fields from Melbourne and never yet failed to use them. Today's trip was no exception - two deer crossed the path some way ahead of us in Spring Wood. Click here to open a larger version of the map in a second browser window. 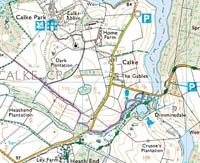 In the centre of the map is a section of woodland. For some years now it has been obvious that local people have been using the paths through this wood. It has never had specific "Keep out" notices and indeed it has had some very helpful path diversion notices on display. On our visit today, there are new path labels and new gates and fences. These have been done by the National Trust who obviously now own the area. So now, for the first time, we are definitely welcome to walk there. The paths are delightful, if a little muddy. The best bit of all is that there is a tunnel leading roughly West from the boundary of the wood. It is solid under-foot and less than 100m long. Take a torch. The tunnel passes under the entry road of Calke Abbey and was originally used for a railway extracting limestone from the old quarries in the wood. It is great fun as an addition to a walk and gives a useful linking-up of some paths. The paths through the Limeyard have now been resurfaced and some bridges built. The muddy paths are gone. Also the onward route of the old limestone railway has been resurfaced. 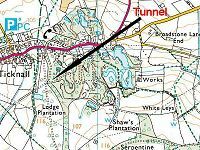 The extra map show both the approach route and the extension beyond the tunnel to a second smaller tunnel. To see it click here. The permissive footpath over Buck Hill is well known amongst Loughborough walkers. Unlike any other Leicestershire footpath that I can think of, this path has a short but quite dramatic ridge in one place. The views from the ridge are excellent - although it is best to stop walking while you are looking at them! However it is a permissive path and, as such. does not appear on maps. 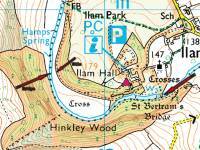 Not everyone can place the footpath on a map, so here it is recorded to make it easier to find. You might like the Grid Refs for the ends of the path, where it joins public roads. One end is at SK504152, where it is adjacent to the Beacon Hill area. The other end is at SK509166, where it is adjacent to the Outwoods area. This footpath seems to have been practically unused, and yet it gives a link from the Beacon to the Shepshed side of the motorway. When we visited it a monumental amount of gardening was needed to get through: more so on the ROW continuation than on the permissive path itself. The images shown here include the continuation ROW that leads to Longcliffe Farm adjacent to the motorway. From there a walk of 200m on a tarmac footpath takes one under the M1 to the start of a bridleway. If you click here you will see a map linking the Beacon to the bridleway on the far side of the M1 motorway. Click here to open a Buck Hill plus Roe's Plantation map in a second browser window. I have only recently (2012) been able to show a GPS track, since the hills and the trees stopped my previous GPS from getting a good fix. With a newer GPS and less leaf cover on the trees I can now show a GPS track. There is a superb footpath linking St Bertrams Bridge with another bridge to the west. The latter bridge does not appear on any maps. The path links these two bridges on the south side of the river. It is very well constructed and would be quite safe to use in any weather. It is a National Trust footpath, which seemed to be recently completed at the date first walked. This is a path with a big future. At the moment many walkers use the tarmac road which is narrow and lacks a footpath. In future this will be the route of choice for all of them. It has been shown here extended to the Calke Abbey entry road, but one may easily turn off to take the grassy direct route towards the main buildings. A permissive path belonging to the Melbourne Hall Estate with no intention to dedicate it. Joins two Rights of Way in an attractive fashion. Otherwise the connection would lead through bland farmland and along a road. Some very attractive mature trees along the shore of the pond.